Rebuilding the City came to be known as the Pittsburgh Renaissance. The most dramatic part of the plan was rebuilding the heart of the city, called "The Point". This is the tip of land where the Allegheny and Monongahela Rivers merge to form the Ohio. Two plans were developed. The more expensive plan required demolishing run-down warehouses, buildings, and rail yards. The expensive plan opened up views of the rivers by tearing down two bridges and building new ones with entrance ramps that eased traffic flow. The expense of the plan required state funding. Pittsburgh’s Renaissance depended upon obtaining more funds than the city alone could afford. Rather than selecting the cheaper plan, Pennsylvania’s Republican governor, Edwin Martin, famously asked “Which one is the better proposal?” 2 Richard King Mellon worked closely with the governor, and undoubtedly influenced his decision to provide financial support so the City could begin rebuilding soon after the war ended. Point State Park showcases Pittsburgh's location at the confluence of three rivers. A 150 foot fountain symbolizes the City's connection to these important waterways. A major part of Pittsburgh's renaissance was restoring the health and flow of the rivers. Deforestation in the headwaters of Pittsburgh's Rivers occurred as virgin forests were clearcut at the turn of the century. The result was erosion and flooding so severe that it shut down commerce in the city of Pittsburgh miles downstream. Confronting flooding and water quality issues required the City to work with upstream states and communities. Studying the problem, It became clear the upper Ohio drainage basin was so large, the Federal government would have to become involved. At the urging of industrialists, dams were built to improve river navigation, storage reservoirs were constructed, and national forests were established to encourage reforestation and control the floods. All these projects involved federal funding. Conservative business interests had long championed local control and state’s rights. Asking the Federal government to buy up logged-over private lands for reforestation broke with the tradition of a limited Federal government. Looking at Allegheny and Monongahela National Forests today, few people realize that at the turn-of-the-century, these lands could hardly have been called forest. They were barren expanses of stumps and brush, or worn-out and abandoned farmlands. 3 Unlike Western Forests that have always been in the hands of the federal government, Eastern forests were purchased from private landowners and restored at taxpayer expense. Passed in 1911, the Weeks Act directed the Secretary of Agriculture (through the Forest Service) to “purchase such forested, cut-over, or denuded lands within the watersheds of navigable streams as in his judgement may be necessary to the regulation of the flow of navigable streams or for the production of timber”. The Monongahela National Forest was established in in 1920 and the Allegheny National Forest in 1923. Funds appropriated for the purchase of land were insufficient, so that today only a little over half of the land within the boundary of Eastern National Forests are Federal public land. 4 However, state forest lands later increased the amount of forest cover in upstream watersheds. Given the City’s history and Thomas Walker’s service on the Water Board of Pittsburgh, the trustees chose a theme of clean flowing water for the Walker Foundation’s website. 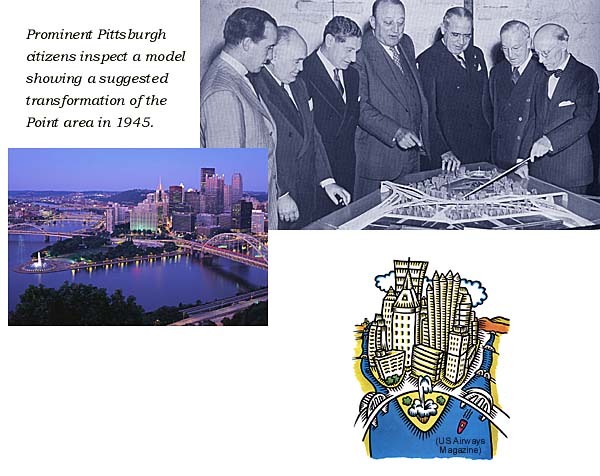 Pittsburgh: The Story of an American City by Stefan Lorant, Chapter 10. The Lands Nobody Wanted: The Legacy of the Eastern National Forests, William E. Shands, 1991.